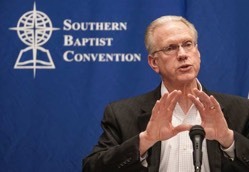 "We denounce the immoral agenda and practices of Planned Parenthood Federation of America and its affiliates, especially their role in the unjust killing each year of more than 300,000 precious unborn babies, its use of particularly gruesome illegal abortion methods, and its profiteering from harvesting unborn babies' tissues and organs," the resolution of the Southern Baptist Convention (SBC), which took place in Phoenix, states. "We urge the United States Congress to defund Planned Parenthood immediately and completely of all federal government support and that all state and local government funding that supports Planned Parenthood be withdrawn immediately and permanently," the resolution adds. The resolution, approved on Tuesday, reaffirmed the Baptists' "absolute commitment to the sanctity of human life." It was titled "On Defunding And Investigating Planned Parenthood." The Baptists also urged the U.S. Department of Justice to "pursue criminal charges against Planned Parenthood Federation of America and its affiliates for their use of illegal abortion methods, trafficking in and profiting from the harvesting of unborn babies' tissues and organs, and any other actions that may be in violation of federal law."